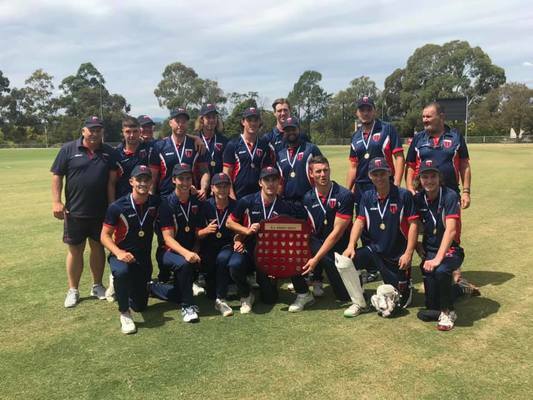 The Dandenong District Cricket Association’s stunning record in the VMCU Neil Wright Under 21 Shield continued on Sunday 27 January, with the DDCA recording its 12th overall premiership, and its 10th since 1996/97. Coached by Springvale South great Craig Slocombe once again, the DDCA’s brightest young stars defeated Cricket Southern Bayside at Schramms Reserve in Doncaster to cap off an extraordinary tournament. After winning the toss and batting, the DDCA lost Austin Heldt and Jordan McDonnell early to be 2/35, but that’s where the Bayside’s momentum ended. Riley Payne (64) and overseas star Jonty Jenner completely blew the game apart in a match defining 151-run stand for the third wicket, combining for 19 fours and four sixes to get the score to 7/219 off their 40 overs. But it was Jenner’s stunning knock that turned heads, with the Narre South Turf 2 star cracking 109 off just 71 balls, in a true sign of his class and ability to find the boundary. The DDCA never allowed the Bayside to reach any lofty heights with their batting, with Matt Wetering (4/22) doing the bulk of the damage with the new ball, while exciting spinner Riley Siwes (2/18) and skipper Brayden Sharp (4/37) helped restrict them to 136 in just 31 overs.